Google has been tinkering with the interface of its blogging platform, Blogger, for months, and it's finally rolling out the changes it's made across the service. On Wednesday, Google announced that the changes--which should make the interface easier to use and more efficient--will be appearing shortly. Blogger's graphics have been improved, but it doesn't stop there. According to Blogger Product Manager Chang Kim, "We've rewritten the entire editing and management experience from scratch so it’s faster and more efficient for you—and easier for us to update and improve over time," Kim wrote in a company blog. Since posting to a blog is the most important thing for bloggers, Google has made accessing the editor for writing and modifying posts smoother and swifter. Whether a blogger is in dashboard mode or on the settings page, they can return to the posting editor by clicking a button at the tops of those pages. The post editor has been simplified and expanded to offer more space for writing and reviewing posts. The dashboard also has a new look--now it has an "Overview" section. This section gives bloggers a quick snapshot of activity at their blog. It has a graph of recent traffic numbers, for instance. 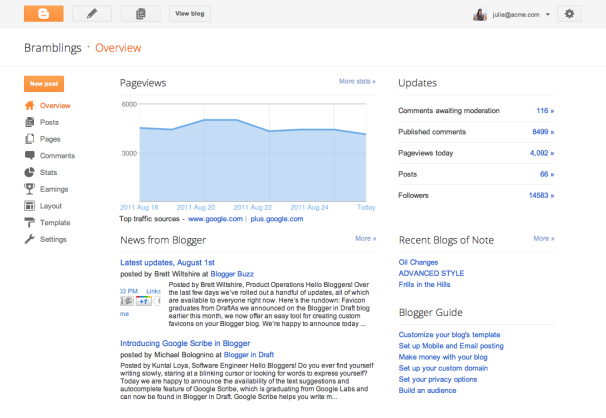 It also gives bloggers a view of recent comment activity and a tally of follower counts. And for inspiration, the section includes helpful links, a feed of updates from other bloggers and a showcase of other blogs that Google thinks will interest the blogger. Another alteration in the new interface is the replacement of the "Monetization" tab with an "Earnings" tab. This change is primarily cosmetic, but is part of Google's efforts to make the language it uses throughout its services easier for users to understand. Whether it's called Monetization or Earnings, the tab still refers to income earned by a blogger through AdSense ads placed on their blog pages. When AdSense is activated through the tab, Blogger automatically retrieves earnings information from AdSense, saving the blogger a trip to the AdSense Website. Google has been touting the Blogger changes since March. Even though Blogger has consistently been one of the top 10 visited websites on the Internet, it has changed very little for more than a decade. In its first major upgrade in 2004, for example, the Blogger dashboard was enlarged and improved to allow posting by email. In 2006, it allowed blog posts to be categorized and drag-and-drop to be used when laying out pages. And…that's about it. Recently, though, up-and-coming services such as Tumblr have outshined Blogger with slick interfaces, mobile apps, and better content discovery systems. More importantly, though, is that the new blogging services found ways to incorporate social networking techniques into what they offer. That social networking slant is something Google hopes to cash in on, too, with its Blogger revamp.